The question on my mind with regards to the smart home these days is the following: Will software be abstracted from hardware? Or put another way, will hardware descriptions and communications protocols move to the software layer? It’s a question that was debated at last week’s Structure Connect conference and one that has important implications for how quickly the smart home sees mainstream adoption. Right now we have some very successful point applications in the home. The Nest thermostat and the cloud recording device Dropcam, which is now owned by Nest, are two examples. But smart lighting like Philips Hue or smart door locks from a companies like Kwikset and August will pick up steam over the next few years. We also have the introduction of some promising platforms from the likes of SmartThings, AlertMe, and Revolv (although Revolv’s platform doesn’t seem to have much of a future after its acquisition by Nest on Friday). These platforms, which Gigaom Research reviewed in its latest Sector Roadmap, often include hardware hubs with multiple radio protocols to enable easy communication with a multitude of smart devices, be they thermostats, lighting, energy management or security. The benefits of platforms is that they deal with device fragmentation and make visualizing the capabilities of the smart home in one governing app possible rather than having to access a different app for every piece of hardware. They also should allow developers to write code and create rules that affect multiple devices. Note that from a larger market perspective, many entrants could morph into smart home platforms and leverage existing hardware in the home. The telcos are certainly interested, evidenced by Time Warner Cable’s Intelligent Home rollout. Many Apple fans still hope that the Apple TV could someday become the hub for the smart home. Now if we can visualize all the connected devices in our homes in one well designed and resilient mobile platform, we’d be in good shape. But if we want to take things a step further, we’ll need to move software control away from the hardware layer to the application layer, particularly if we’re going to get to the third evolutionary step, which is a software platform that is context aware. A context aware platform could make autonomous decisions like preheating your home as you’re leaving work. Allowing software control of various hardware resources allows for creative developer solutions like allowing a smoke detector to also flicker a connected lighting system during a fire for extra safety. But to get to this next step it’s much better to just have the hardware capabilities accessible at the intelligence level — the software layer — rather than on the device. In fact, many platforms may wind up in the cloud and we may evolve away from hardware hubs. The creative solutions are larger than I can imagine but whatever they turn out to be, they will rely on open ecosystems for developers where all hardware is accessible. 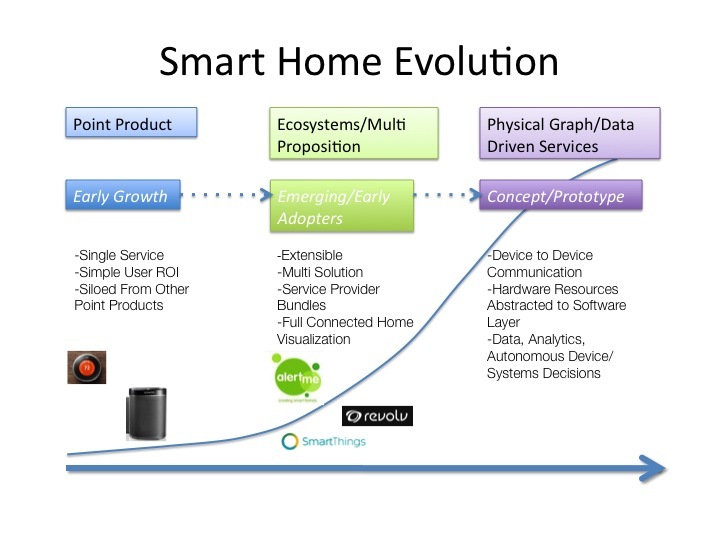 I recently explored the technology principles that should guide the evolution of the smart home in a Gigaom Research report Projecting the technology path to the smart home. This need for open ecosystems creates tension in the market between those companies that may want to completely control all aspects of accessing their device versus the needs of the consumer to have a user experience that makes interacting with multiple home devices easy and engaging. It’s possible that a few standout home devices might keep us locked in a world where consumers choose to invest in only one or two devices with clear benefits. But I think that’s improbable since the proliferation of home devices will create an opportunity for a strong platform to increase the value of all of those devices by making them easy to manage. But one thing’s clear: to achieve this vision, some degree of device control will need to move to the software layer, which should benefit all creative developers with ideas about how to best to use all of these newly connected hardware resources in the home. I am noticing that larger companies have more closed off hardware. Google is the exception with Nest’s open api. Generally smaller kickstarter type projects are more willing to offer an api. We just connected the Smartthings hub up as a gateway and it works pretty well. I hope Samsung doesn’t shut this type of thing down! But I see things going towards tools that encourage connectivity rather than avoid it by all means. Honeywell is a great example. They love to hold their APIs close and secret. Why? We want to connect things to http://nenrios.com so our rules can control any device and connect with any person. Luckily we don’t have to depend on clunky old farts like Honeywell and Cisco and LG who all have devices without APIs. Plenty of grassroots projects are changing the tide. Take the microduino or the Smartent products. Connected is the only way forward with home automation. The one thing I find most encouraging about the smart home evolution is the spotlight it puts on data, and how utilizing data gathered even over a short amount of time can improve how people function. My hope is that this attention increases the investments organizations commit to their big data journey. According to a recent IDG SAS poll, there is a dire need for more attention since most primary tasks remain difficult for businesses.